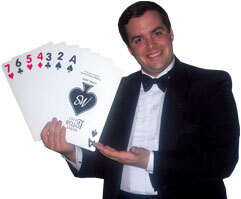 For your next Christmas Party, Banquet, or Wedding Reception imagine having a magician who goes from table to table entertaining your guests upclose and personal. It’s a great past time for Weddings while the guests are waiting for the Bride and Groom to arrive. Here is what a few satisfied Brides and other clients had to say about it. "My daughter and her fiance wanted a wedding reception that would be fun for everyone, young and old. A magician appeals to every age, so The Great Scott table hopped during dinner and then after dinner, we had the DJ take a break, and Scott did a 30 minute presentation on the stage in front of the bridal table. He involved the bride and groom in some of his tricks, and even the maid of honor got into the act. All the kids sat on the floor in front of the stage and were mesmerized. For months after the wedding we heard comments from our guests about how much they enjoyed the reception." "The Great Scott made our wedding an unforgettable event for us, our friends and our family! So many of our friends still talk about the magic and fun that set our wedding apart from others." "The Great Scott" is professional, entertaining, affordable and has amazing talent. I would recommend his table-hopping to anyone planning their wedding. For any bride, it is difficult to entertain guests at the beginning of the reception, before the wedding party has arrived. Having "The Great Scott" table hop at the reception while the wedding party was having their pictures taken was perfect! I didn't feel like I had to rush through my pictures and I knew my guests were being entertained! When I arrived at the reception, I had multiple people tell me how much they enjoyed the entertainment and how the time flew by! "The Great Scott" is really the perfect addition to any wedding reception.